Screen saver displays text and picture. Is there a better alternative to LogoSaver? Is LogoSaver really the best app in Screen Savers category? Will LogoSaver work good on macOS 10.13.4? 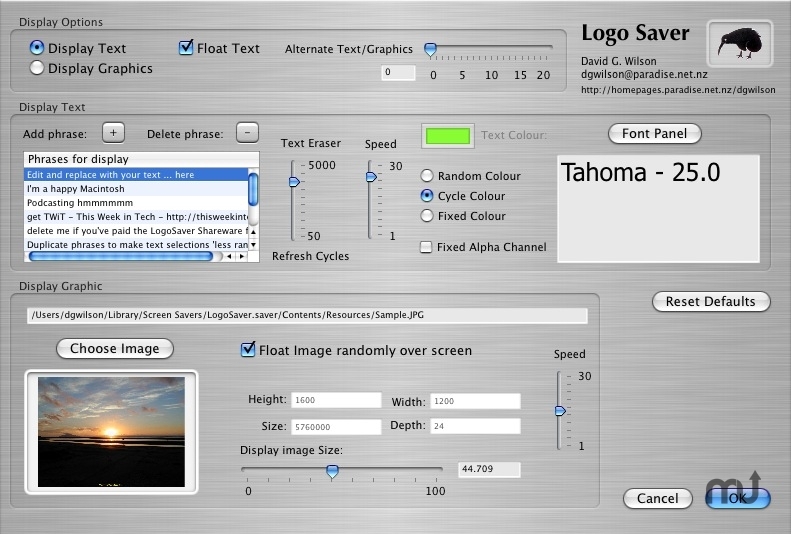 Logo Saver is a screen saver module for OS X that displays text randomly over your screen, you can choose to fix the text colour and font/size or have the text colour change randomly. It also displays a picture of your choice and can optionally float that over the screen while bouncing off the edges of the screen. You can also choose to have the text swap for the picture and vice versa - a timer is provided for this functionality. Supported OS X versions 10.6, 10.7, 10.8, 10.9 (built for 64-bit). Fixes an issue with image sizing on larger screens. LogoSaver needs a rating. Be the first to rate this app and get the discussion started!